Friends of the Glenelg River were a very active group. We conducted activities that were fun, educational and have a positive impact on river health. While we are a lot quieter these days, our goal is still to provide activities that every person in the community has a good reason to get involved in the Glenelg River in some way. Our main goal is to involve the whole community in environmental projects. Some are just for fun like the free canoe days, the annual art competition and the annual tug of war across the river. Other activities are aimed at providing information about the river, like the calendar and the walking trail with it’s interpretive signage. And then there are the projects that will directly benefit the environment; they include our seed collection and tree planting days, and removing litter from the river. Friends of the Glenelg River Inc members believe that the best way to protect our environment is for the whole community to get involved. If you would like to get more involved feel free to contact our office on 55542323 or by talking to Tim Burnard (President) on 55 812205. Canoe day, a great success! 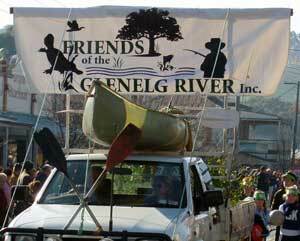 Friends of the Glenelg River were extremely pleased with the Canoe Day held at Rotary Park last Saturday. More than 100 people took to the water with many more choosing to sit on the banks and watch the antics. As usual, canoes were available from Rotary Park until 1.30PM. Canoeists were able to travel upstream to the first sand extraction site (behind the Footy scoreboard) and see up close the results of the replacement of snags in the river. One big result is the additional habitat that probably had a lot to do with the abundant birdlife along the stretch. Paestan Canoes from Dartmoor offered expert training on the day to all first time canoeists, but many people had returned from previous years free canoe days and were easily able to head off without instruction. Friends of the Glenelg River are hoping to continue having free canoe days as they are excellent opportunities for the whole family to play in our beautiful section of the Glenelg River. The Friends of the Glenelg River art competition is on again. Results and images from the evening Friday 14th March 2008.